So alperantly the cast list for the new game was accidentally leaked. Takenhead though that this could still be faked. I would hate to claim this fake and it ends up being real, I want to get hyped. Daitarn 3 was really fun in A Portable and it kinda just there in V and Banjo was even worse in X. Fun in AP and Fun in V.
Sure, I'm glad Zeta is gone but... why? Victory.. yech, Victory doesn't exist anymore. Really no 00 and why Destiny coming back? Cross Ange again, Yay!!! 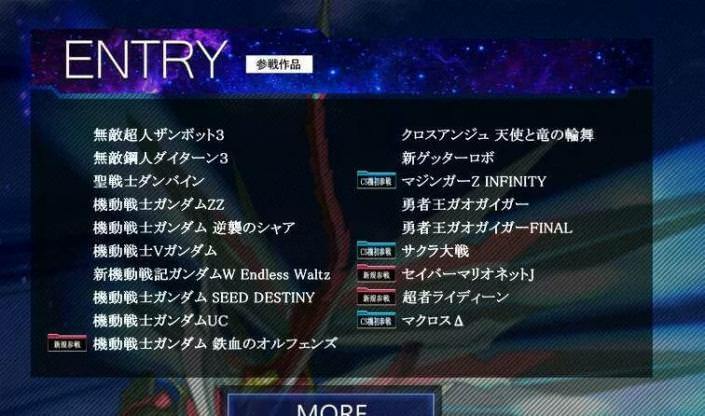 Ange is the next Gundam Seed Destiny it will be in every SRW game for now on. It's better than no Getter but... New Getter not Shin Getter? As for the debuts, wow they are really cool. Cross Anges plot pretty much makes it adaptable to any srw plot. Helps Nana Mizuki is a huge attraction. Daitran 3 needs to take a hike though. Id love Macross Delta but they need to fix the awful plot where the actual protagonists got shafted for the entire thing and ended with it trying to glorify the Nazi Youth antagonists. And yes thats apt because the Windmere enemies were straight up more Nazi then Zeon. What robot is on that Pic? I need to rewatch Delta, I didn't like it. I agree Daitarn needs to take a hitch, but it was fun was AP despite being boring in Y and X. They can make Daitarn 3 be fun. I like Cross Ange, find it funny it would now be in the same number of games than Code Geass and Gurren Laggan. Kinda want this List to be real. I haven't seen Saber Marionette J - does that have anything giant in it or just solid cheating? Mazinger Infinity, IBO, and Delta (which I keep forgetting about) seem like the most obvious guesses. That is a pretty decent amount of new and new old stuff though, isn't it? Probably the biggest thing that makes me skeptical, although it's not impossible. Did anyone actually save the page or whatever this is from? Same, I highly enjoyed Cross Ange. Most of the people whonvdg mad about it for some reason seem to miss the the point that Fukuda and crew basically made it to poke fun of mecha and other genres. No clue on the pic. Maybe the original? It looks kind of bug like like based on a Dunbine design. Same. Its weird but itd be good. And thankfully no FMP again. The mech in the pic is Salamander's unit from Cross Ange, look at the head antenna/tail and the wings. This time, I'm interested. New Getter, Sakura Taisen, IBO. What's with Saber Marionette J tho LOL. That is, if this "leak" is correct. Sakura Taisen isn't too surprising, it was in the project X zone games which were made by Bandai. Plus, Sega had Virtual On and Hatsune Miku in previous games, so Sega already has a foot in SRW before, lol.